Top artists share their painting tips. Plus: JC Park interviewed, and advice for using social media to boost your artist profile. When it comes to being a professional digital artist, there’s no substitute for good technique. 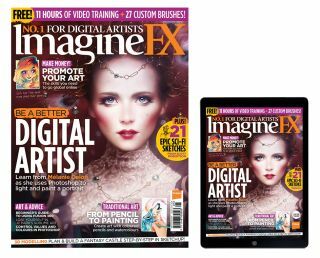 The new issue of ImagineFX is bursting at the seams with quality content from the best digital artists from around the world. Mélanie Delon uses Photoshop and specific lighting skills to paint the gorgeous cover portrait, concept artist Donglu Yu develops a fantasy castle in SketchUp before working it up in Photoshop, and Martin Hanschild shares his knowledge of Rebelle in his ongoing series. Craig Spearing manages values and colours in a classic fantasy composition, Jort van Welbergen introduces Fusion 360 as he creates a 3D drone concept, and John Mahoney concludes his excellent ZBrush series by explaining how to breakup and then rebuild a 3D concept. Elsewhere, the team caught up with popular South Korean artist JC Park to talk about how his best work was never published, concept artist Scott Robertson opens his sketchbook, Dorian Iten talks knowledge, and pro artists advise the social media knowledge that helped them become global superstars. This is one issue of ImagineFX you need to get your hands on! Want to share your art with fellow readers? Then email us at fxpose@imaginefx.com, and you could appear in ImagineFX! Pro artists including Lois van Baarle and Ross Tran give their tips for using social media to promote their work, and rustle up business. Want to know how to paint a glass reflection, or make better use of Photoshop's Smart Layers? Then our pro artists can help! Prolific video games concept artist JC Park reveals why a good story lies at the heart of every image he paints. Discover how Mélanie Delon painted this striking portrait piece for this month's cover, using light to bring the figure to life. Craig Spearing takes you through his process of building on a strong greyscale foundation to create a classic fantasy character. We review the latest version of ArtRage, which won't break the bank, and Phil Galloway reveals his love of the software. Katy Lipscomb wields her coloured pencils and watercolour brushes, and paints a stylised scene of a wolf howling at the moon. You can also get a free copy of Rebelle, the natural media painting software, worth $60, when you subscribe to ImagineFX. Full details inside the issue, which you can also buy on its own: just click here!